Hours of operation: Sun. – Thu. 11:30 a.m. – 2:00 a.m.
A tall, row-house style bar, you can have varying experiences depending on the weather (the front patio is small but comfortable, away from too much traffic noise and exhaust), or depending on what part of the inside you choose to occupy: the dining area in the back, the small room upstairs for private parties, or the main bar area. Each serves a different purpose. The private room is a bit like someone’s nice living room – with a bar it in. But it is meant to fit up to forty people. With more than twenty, it could be tough to even raise your glass to your lips. Regardless, it adds an extra space and a different attitude from the downstairs. There, the plain wood fixtures – potentially rustic and classic – are a proverbial brown paper-bag. The dining area contains the prerequisite chairs and tables, and there are seats at and around the bar up front; little is remarkable. Yes, there is a lack of distinctive personality, and that means don’t expect too elaborate a tap selection. The Bass, Red Hook, and Sam’s Seasonal are fine, but luckily a few more intriguing options can be found in the bottle department: Hoegaarden, Newcastle, and, best of all, a couple of Sam Smith varieties provide more of a mix. So there are lots of hits-and-misses. And yet, when one witnesses other bars bending over backwards to draw in those students with their disposable incomes, such a plain place can be refreshing. 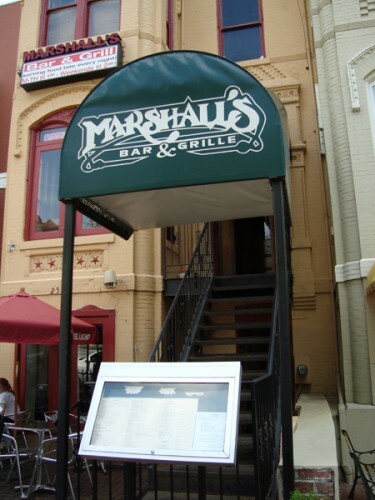 For anyone tired of being swarmed by near-teenagers the second the sun goes down, there are worse options than the simplicity of Marshall’s Bar & Grill.